Would you like to publish your very own edition of Dog Joy, featuring just your adoption stories? This is a unique and powerful way to share the great work you are doing and raise necessary funds. Caroline and her mother, Becky, have founded Dog Joy Books, which is a book publisher dedicated to helping dog rescue organizations raise awareness and funds through the publishing of unique storytelling books. These effective fundraising books provide rescue organizations and shelters a powerful and unique way to raise money and awareness with no upfront costs to your organization. 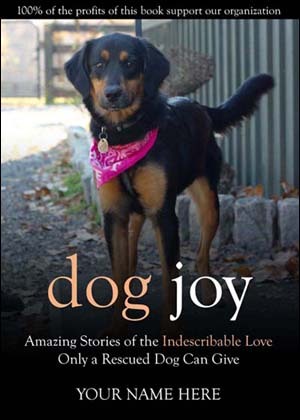 Dog Joy Books removes the tedious and difficult work of publishing a book and gives rescue organizations an easy and simple way to create an effective fundraising and publicity tool to share within their community. For more details about how we can help you publish your own Dog Joy edition(s), click the button below.